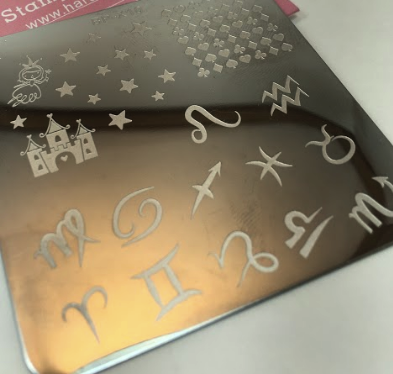 Review: Constellation and Zodiac Stamping Plates from Born Pretty Store! Hello and Happy New Year to all of you! I hope you enjoyed a wonderful holiday season. I have been spending lots of time with family during this season, and it's been so nice. 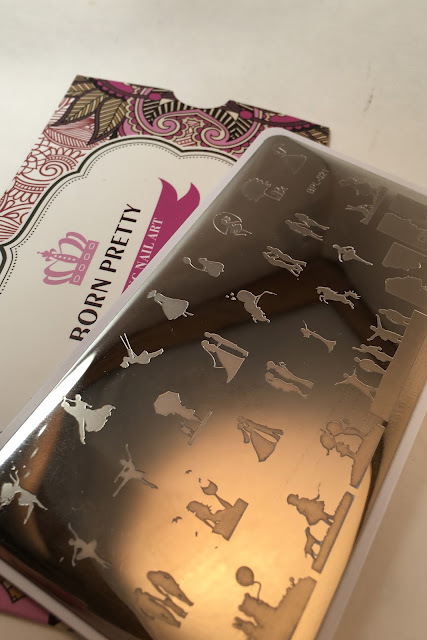 Today, I have a few stamping plates sent to me from Born Pretty Store to show you. 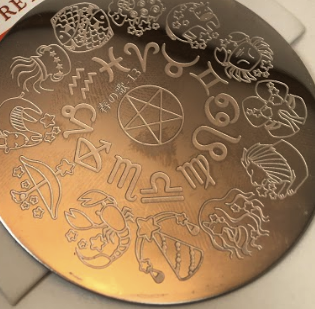 Last year, for my birthday, I did a couple of manicures with my astrological sign, and I only had one plate for that, so I had been looking to find more plates with zodiac signs so I can have more stamps to choose from. Plus, I could always do some cute birthday nails for anyone who wanted them. So, of course, I went to Born Pretty Store, and found a couple new plates with different designs. The links below each plate is where you can find them on the BPS website. For the first design, I actually did weeks ago when we were in Sagittarius season, I combined the December birthstone (topaz) with the zodiac sign. 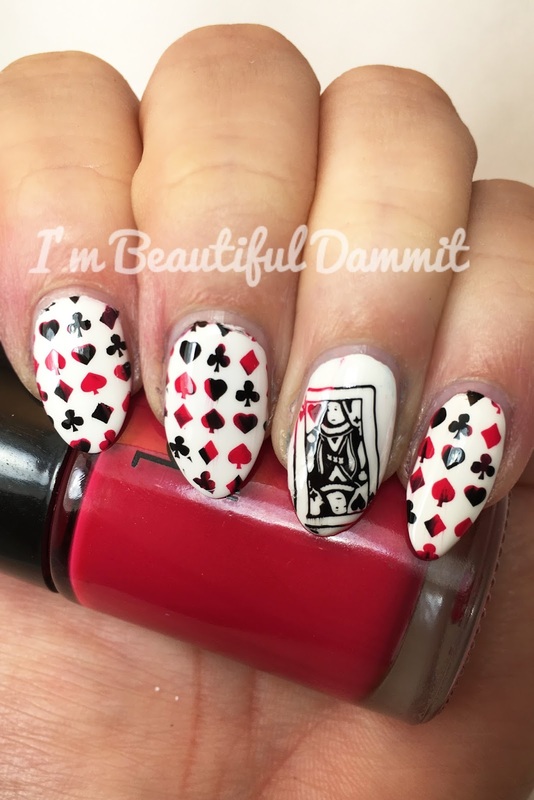 I used stamps from both plates for this look. With holidays, I hadn't gotten around to doing a Capricorn design, but it's still Capricorn time until January 20th, so maybe I will have something up soon! For the second design, I wanted to get a little more use out of the Zodiac Design Plate #29983 because I really only used one stamp, and I was sure I could do something cool with the other images. I'm not really a princess-type of person, but I do love Las Vegas, so I did a poker design instead. It was a simple and quick design, and I love how it came out! I think I have found my new Vegas vacation mani for the next time I visit. I really liked both of these plates, especially the Zodiac Design Plate. The way it was laid out, it was very easy to pick up the designs, so I was happy with the spacing. With the Constellations plate, I had to be extra careful when trying to pick up the inner symbols, because they were so close together, and I would have to quickly clean up anything extra I picked up before I stamped it on my finger. It wasn't bad, but just know that going in when you're using that particular plate. Still, I really love that this plate had two different designs for each star sign. They're really cute! Currently, these both retail at about $1.59 on sale, and $2.99 regularly. I would say, definitely pick these up if you're a fan of astrology, or want to do a little something extra for an upcoming birthday. Today, I have another review from Born Pretty Store. This time, it is one of their fantastic stamping plates. I have used their plates for about a year, and have been continually impressed with the quality of these plates at their relatively affordable price. This item was no different. It has the quality that I have come to expect from Born Pretty Store! This is the plate itself (Item: #20786). It features a series of silhouette images of dancing, romance, and family. With the various types of images, one can find lots of uses for this item. I know I will be using this plate often. It can be found for purchase here for about $2.99-5.99, depending on the current sale going on at BPS. Still, very affordable, and comparable with other brands, and the quality is outstanding. With this plate, I did two different manicures. The first one is based on my favorite part of the ballet, The Nutcracker, which is "The Waltz of the Snowflakes." 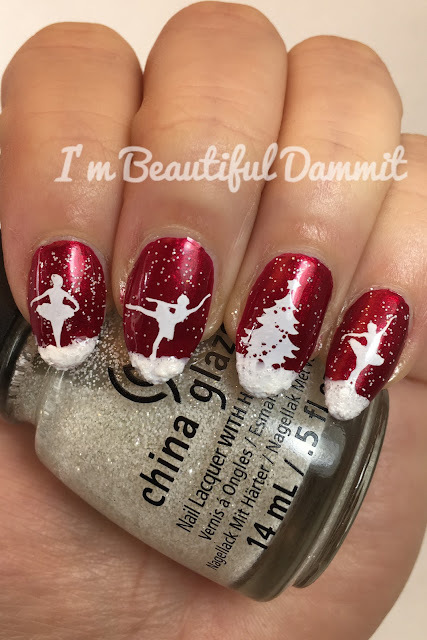 Going to see this ballet is an annual tradition for us, and with the season rapidly approaching, I thought I would make my first Christmas manicure with this plate. 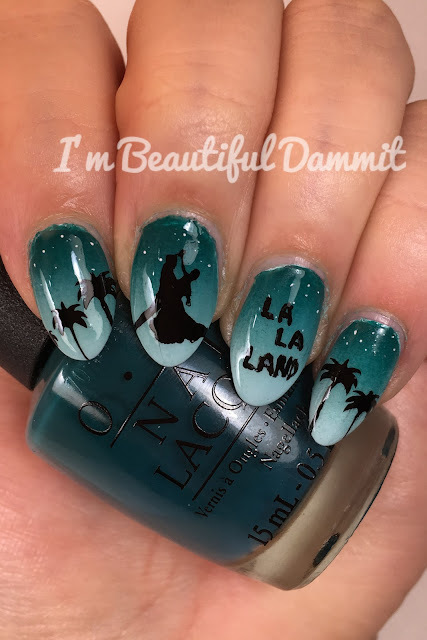 The second manicure I did was inspired by the upcoming movie La La Land featuring Ryan Gosling and my manicure muse, Emma Stone. I'm really excited about this movie, and it's getting a ton of Oscar buzz. I plan on seeing it as soon as it comes out! Overall, I love this plate. The images are well defined and pick up well. I also like that it has no set theme, so there are any number of designs you can come up with using this plate. Definitely a great purchase. I hope you are all doing well. I have been insanely busy these days with work, travel, and life in general. I have a TON of manis to post in the coming week, so look out for those. However, today, I have a special post as it is the very first of my collaboration with Born Pretty Store! I have used many of their products since I started really getting into nail art, and have loved what I've tried so far, so I was happy to check out what else they had, and try them out for review. 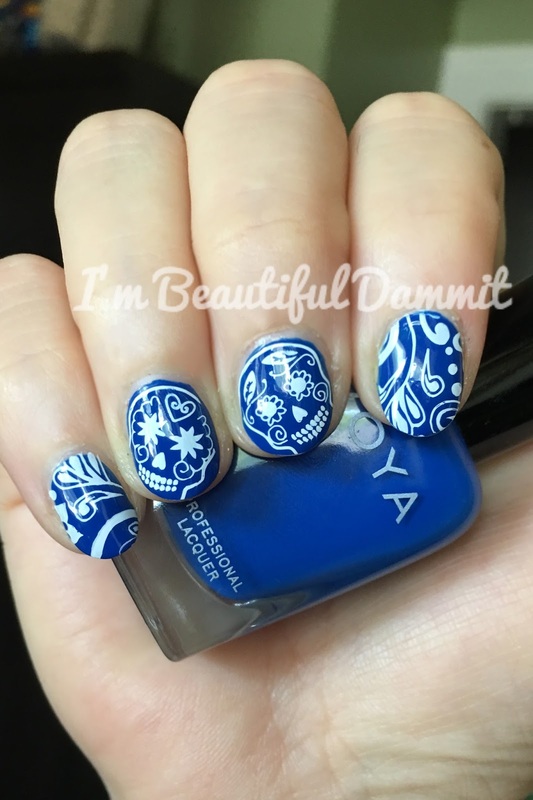 I have never used water decals before, as I primarily work with stamping and some light hand painting. I was not sure how much I would like them, or if I could use them without messing them up. I'm one of those people for which Pinterest fails exists. Nothing is ever as easy as it looks, but surprisingly, I found these decals to be very user-friendly! The decals that I chose here were a pretty floral themed set (Item #33972). They can be found here. They are rather inexpensive (a little over a $1.00), and for that price, you get two patterns for two full manicures. I cannot stress how easy these were to use. Anyone can use them, and they look great! 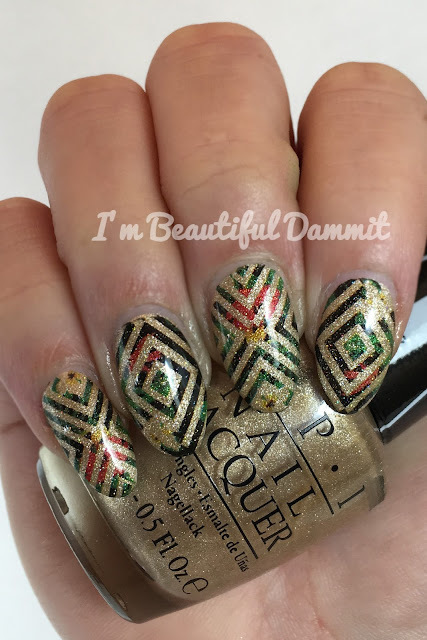 For this first design, I really liked the diamond shape, so I used these decals over a gold base color. I kind of cheated here, because in order to do a full manicure, you might want to buy two sheets, but otherwise, the complementary accent decals were leopard floral print. I just happened to really love the look of the diamonds so much. I thought I would just use them this time. I added a sparkly topcoat to make it really shine. So pretty! Base color: OPI - Love. Angel. Music. Baby. The second design is a floral/leaves design. I wasn't sure what color to use as a base, so I just went with a simple white base so that the design could really pop. I absolutely love this design. It's a great look for a tropical vacation. Of course, since I love sparkles, I added another sparkly top coat that really made the manicure stand out. Overall, I really liked these water decals. They were easy to apply; clean-up was fairly simple even though I used no protective barrier on my cuticles, nor did I cut them to size. 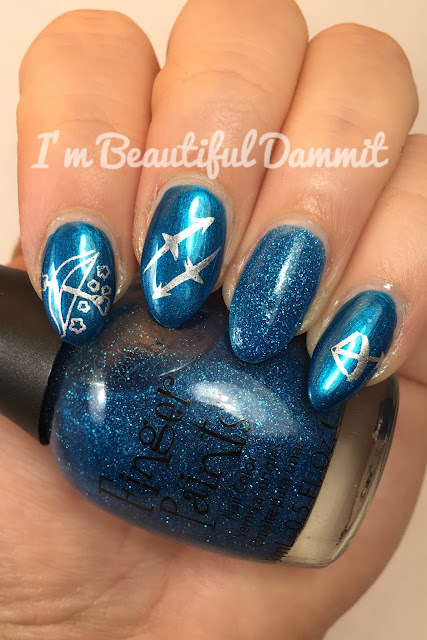 Not all of my nails have a normal C-curve, and if you're like me, things like this might seem to have a wonky fit, but these decals hugged my nails perfectly! I wore these for a full five days with little to no tip wear, and only removed them because I had to move on to work on other manicures. So the bottom line...would I buy them? After trying these, I'm really looking forward to seeing what other designs I can find from Born Pretty Store. They seem to have a wide array of different kinds of themes to suit your tastes. I hope you're all well today as we are wrapping up another work week soon. I've been keeping myself busy, and keeping up with the challenge, but falling a little behind posting my manis here. I'm hoping to get things on track over the weekend when I have more time to write and post here. For now, I am going to combine some of these posts. The first mani we have is for the blue prompt. I love love love this blue from Zoya, and hadn't gotten a chance to use it, so I was glad to pull it out. I also had this cool new plate from Moyou London that I had been itching to try out, so I thought this would make a pretty combination. Sia - Zoya for the base. Next up, we have the violet prompt. 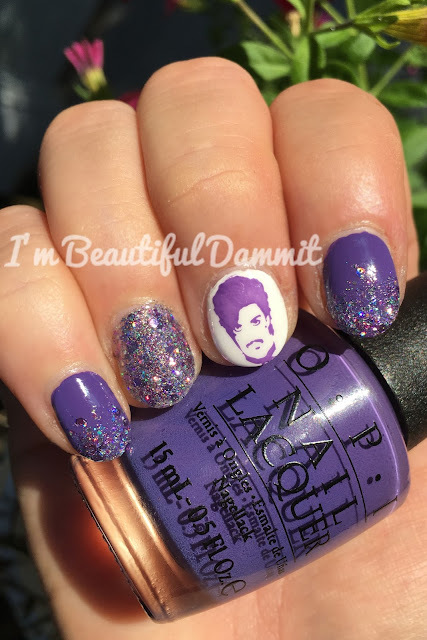 I've probably done at least 4-5 tributes to Prince with my manicures. I don't always post them, but I love him, and I love this color. So, of course, I had to do this manicure in his honor. I had the good fortune of seeing him just last year in concert. An amazing show! I'll never forget it. 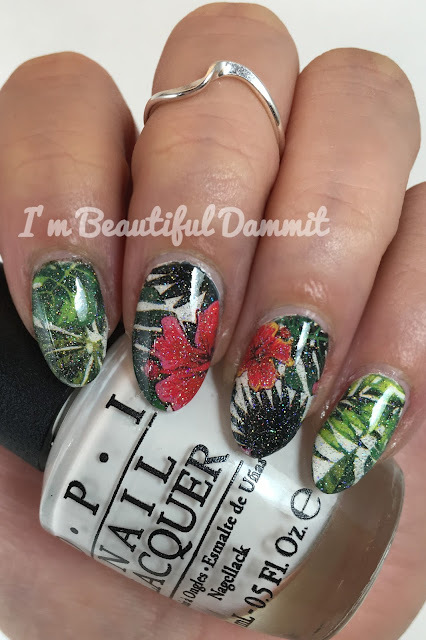 Lost My Bikini in Molokini - OPI for the base color and stamping color. Pointe Blanche - Orly for white nail base. Storm - Esmaltes da Kelly for the glitter accent. Lastly, we have the black & white prompt. I'm a huge Beatles fan, so I wanted to use this stamp for this manicure. This was a pretty easy one to do. Just the bases, and couple of stamps. I was done in no time! 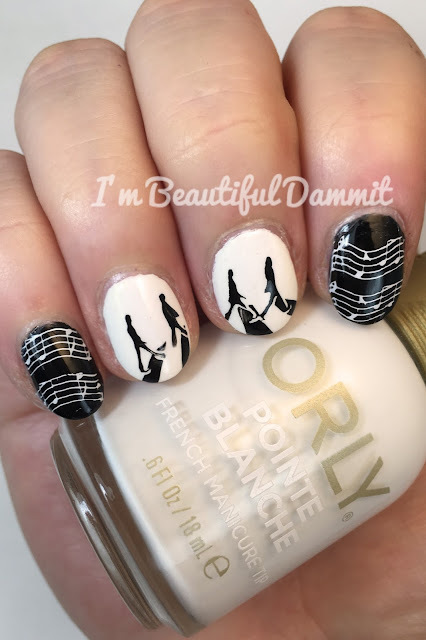 Perfect quick mani for the busy music fan. Pointe Blanche - Orly for the white base. Black Creme - Wet n' Wild for the black base. BP -13 plate - Born Pretty for musical notes. I hope everyone is having a wonderful Monday! It is Labor Day here in the States, so many of us are enjoying the holiday. I ended up being woken up by a phone call from my mom, so I'm extra sleepy right now. However, I did have a wonderful weekend, playing with some of my nail art stuff, and having my little cousin over so she could have fun using my nail stamps my giant stash. I think I have a nail polish buddy! Yesterday was so lovely for me, because I finally pulled out the Fall candles, the weather was beautiful, the house was clean, and I had the whole day to relax, and watch scary movies. Halloween season is here! Anyway, I got so relaxed, that I didn't even bother posting to the blog. Whoops! So today, I am posting my nails for both Day 3 and Day 4. Day 3 was the yellow prompt. Now, I saw many nail artists say they really dislike yellow, but I don't. I love yellow. I don't get to wear this color much, but I just love this bright color, and I really liked this look. 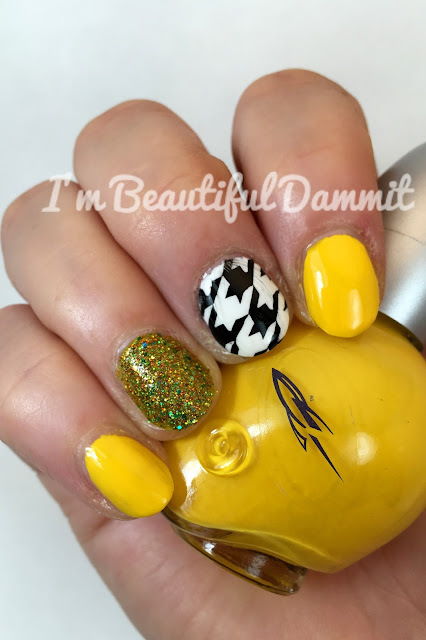 It was like a shot of sunshine on my nails! I have to say that I absolutely adore this yellow polish from Color Club. It went on nice and smooth with great coverage. Also, the little bottle is so cute! It's a University of Toledo Rockets football helmet, and that is my alma mater. Game Day Gold - Color Club for the yellow nails. The Flash - Esmaltes da Kelly for the glitter accent. Pointe Blanche - Orly for the white nail. Okay, next up is my green manicure! I love the color green sooo much, and this was the perfect opportunity for me to do my Slytherin nails. I love Harry Potter, and last year, I used my Potter plates to do my nails for the book prompt. This time, I just wanted to focus on my favorite house. As you can see, I did use a matte velvet for the base because I thought it was the perfect color to use, but I did end up putting a top coat over it, and whoa! 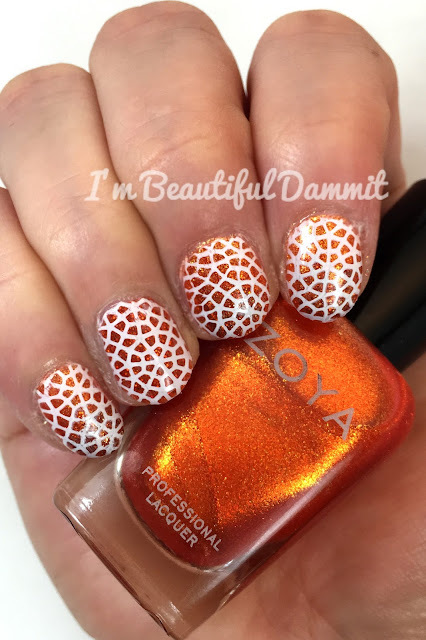 Those Zoya matte polishes always pop with those glossy coats. 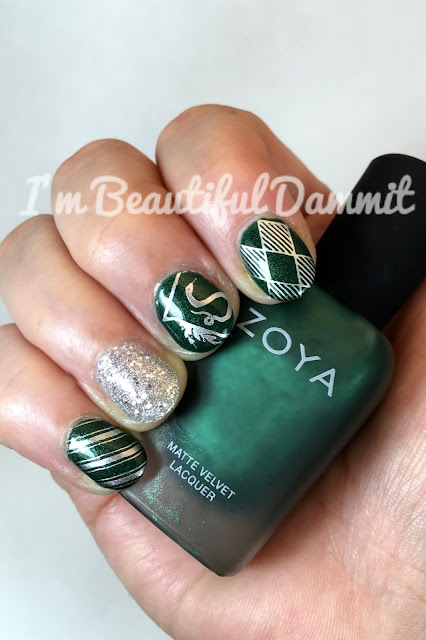 Veruschka - Zoya for the green base. Snow Crystals - Finger Paints for the glittery accent. Plate hehe 027 - Aiyoohehe for Slytherin crest. Plate hehe 026 - Aiyoohehe for diamond pattern. And that's it for today. I will check back in with the blue manicure next time. Day 2 was yesterday, and we had the orange prompt. I was at a loss for what to do, and had a busy day, so I had a little bit of a nail fail, I think. Not what I was expecting, but it came out okay. For this one, there is no theme. Just a simple design. I'd actually wanted an ombre effect under the stamp, but I think I may have chosen the wrong stamp design because you can't even tell. Perhaps, I should try this again with a more open, or delicate stamp. I also did a really pretty glitter accent nail. You literally cannot tell the difference. Oh well. Nine Zero - Holo-ween as the accent nail which you can't see. See you next time with my yellow nails! It has been waaaaay too long, but I've had so many changes in life that have made it difficult to get to the blog. I've been traveling quite a bit, and my charge is getting so big now that it's hard to keep up with her and my nails at times, but it's been so much fun! Life has been really good. 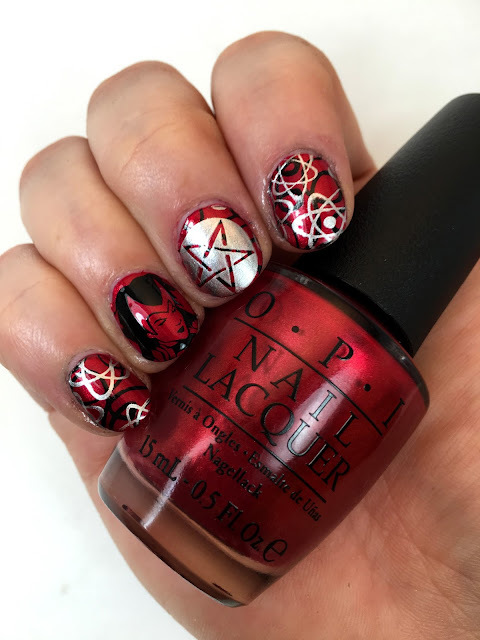 As you know, every September, lots of nail artists participate in the 31 Day Nail Art Challenge, and it is that time again! I had such a blast doing it last year that I had to do it again. What better way to kickstart the return to the blog than a daily challenge? Here are our prompts for this year. They are the same as last year, and I am so excited to try to come up with new ways to decorate my digits! For the first day of the challenge, the theme is red, so as I was looking through my new stamps that I had bought over the course of the year, I realized that I had never had the chance to use my Scarlet Witch stamps from Aiyoohehe. Having the red prompt was the perfect opportunity to try them out! You may notice that I'm in the nub club this year, but I had a nasty couple of nail breaks a weeks ago when I was traveling, so I started over. It was sad because my nails were the longest they'd ever been, but I won't let my little nubs discourage me from doing this challenge. I know a lot of people tell me that they would love to paint their nails and have fun with them, but they won't grow out, but having short nails is no excuse not to experiment. You can rock nubs, and enjoy a little nail art. In fact, that's how I started on my journey of nail arting, and getting my nails in better shape. Since I had let my nails go a little the last couple of weeks, finally taking care with them, and doing a little nail art was just the thing to perk up my mood. I love painting my nails so much, and it always makes me feel great walking around with a pretty manicure! Anyway, onto the mani of the day! And that's it for today! See you next time with my orange inspired mani. Well hello there, Valentine girls and guys! 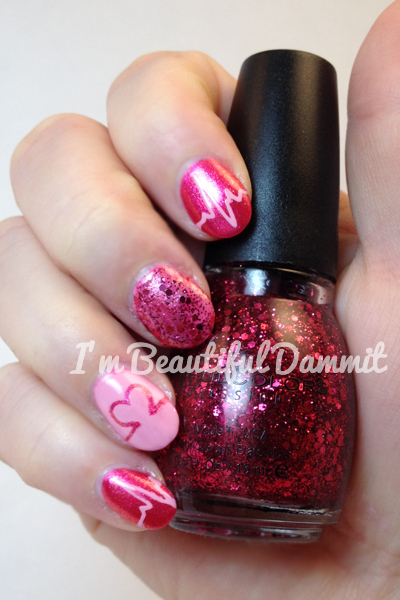 I had a little extra time in between swatching to do some nail art for Valentine's Day, so I wanted to share it with you. Now, let me preface this by saying that I used some vinyl stencils that I got free with an order from WhatsUpNails.com. I had never tried stencils before, and I don't know how you people make these look so perfect, but I clearly failed. Still, I thought these were kind of cute, so I decided to post them anyway. I made a big oops on the middle nail, so I just sponged over it, and covered it with glitter. I wish all of life's problems could be so easy to fix. Just throw some glitter on it, and it's all good! OPI - Say Hello Kitty for the base color. Sally Hansen - Pink Blink for the light pink creme polish. Sinful Colors - Decadent for the glitter accent. Well, this post was a long time in the making. During the Fall, I got hooked on Instagram, and started seeing tons of swatches for this collection. Just in the past few months, I opened my eyes to the wonderful world of indie brands, and this was my second venture. 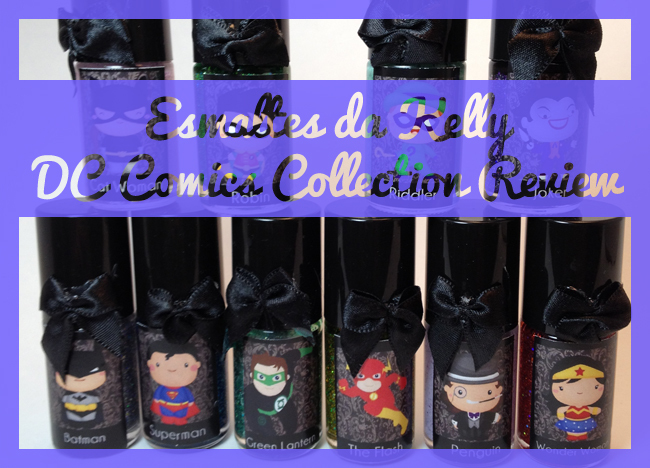 I've really become a fan of these by Esmaltes da Kelly, and comes up with some really beautiful, fun polishes. This is a huge, two-part collection dedicated to the characters from Marvel and DC Comics. Each part includes 10 polishes each, bringing the total to a whopping 20. So needless to say, this took me a little while to obtain the entire collection. At first, my intention was to just collect a few from my favorite characters for the novelty, but I loved the polishes that I bought so much, and all those gorgeous swatches on Instagram made me want more. Before I knew it, I was collecting more and more as time went on. I finally finished these off when my dad bought me the remaining polishes for my birthday. So now, I can happily present to you my review for this collection in two parts. Hello lovelies! Today is a post that I'd wanted to make before the holidays, but I just ran out of time. Now that things are settled down, I still wanted to review this collection. 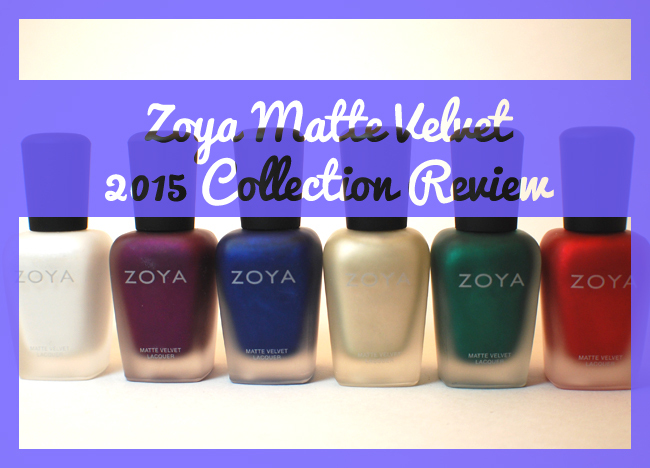 This is the newest collection of matte velvet shades from Zoya. As you can see, they chose a palette very similar to the previous matte velvet collection, but instead of going with darker colors, they went with some light shades this time around. I don't have the swatches for the older collection, but you can check them out here at one of my fave nail blogs, The Polishaholic. These are not dupes by any means, so in case you're thinking of skipping this because you got last year's collection, think again. You're definitely going to want to grab more than a few of these.